The Takeaway: Fun and bright. Now focusing on melding the kitchen more with the bar, their cocktails are “out there” with a clear molecular gastronomy bent, although some tastes can be jarring. The large garnishes are a key attraction here. There is little pretense, and the atmosphere is light and approachable. 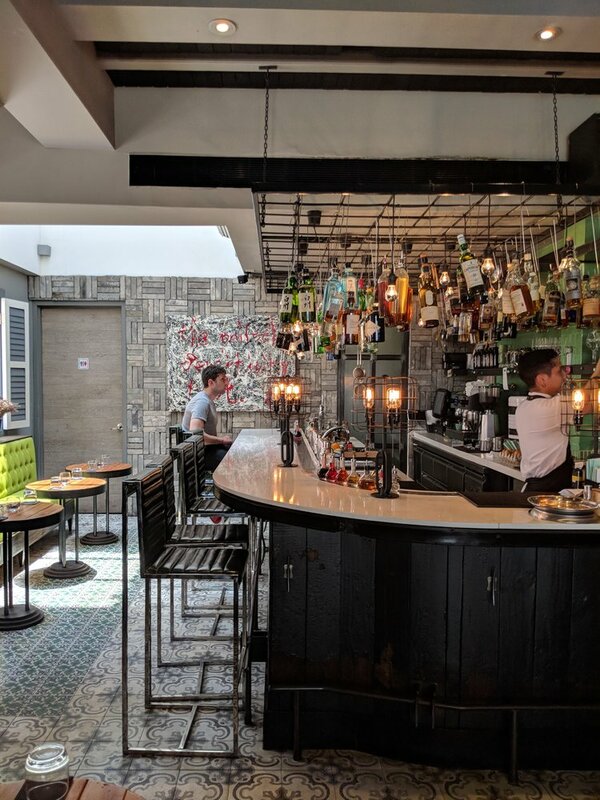 The Tippling Club bar is a molecular gastronomy restaurant, with an elegant, modern main dining area and a smaller, well-lit enclave located behind the host stand of a molecular gastronomy restaurant. 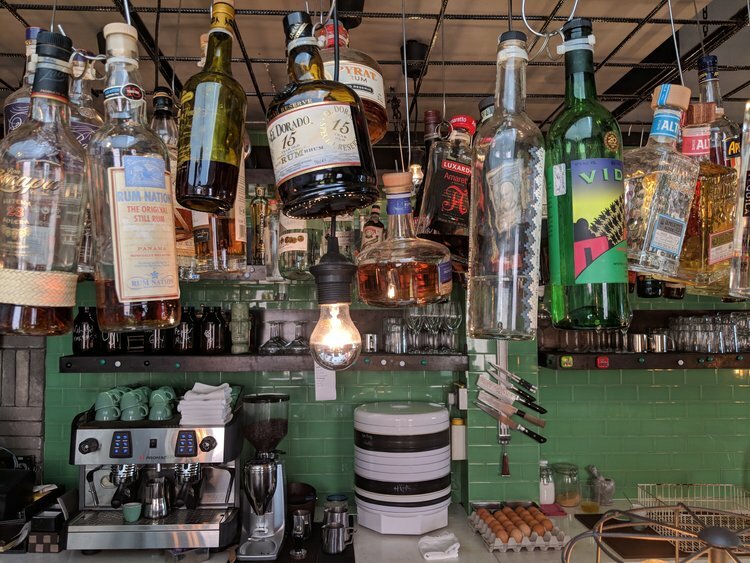 The decoration of the smaller bar is funky and bright like that of a hipster cottage, with spring green walls and bottles strung haphazardly with wires from the ceiling, rather than stacked neatly on a bar shelf. 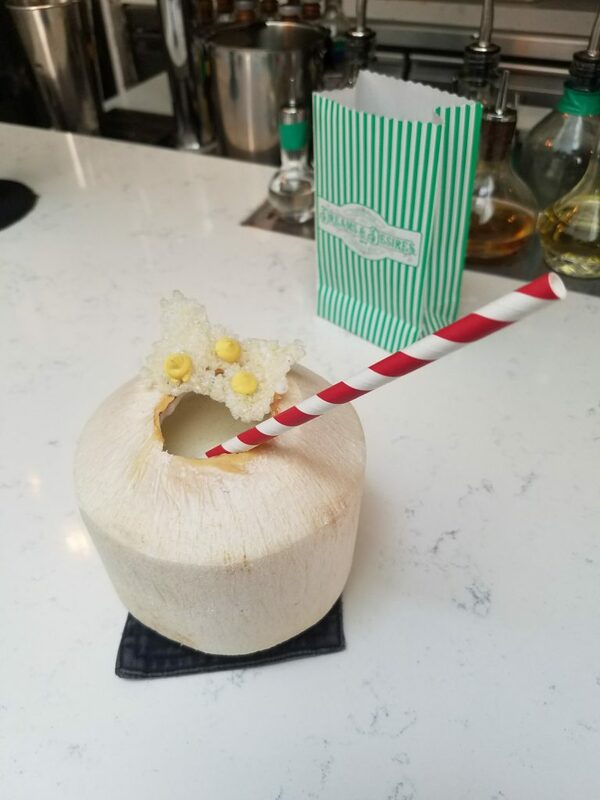 We stifle squeals of glee when two white-and-green popcorn bags filled with a multi-colored array of gummy bears are placed beside a menu with cartoons of the gummy bears drawn exactly to scale for placing the gummy bears upon. 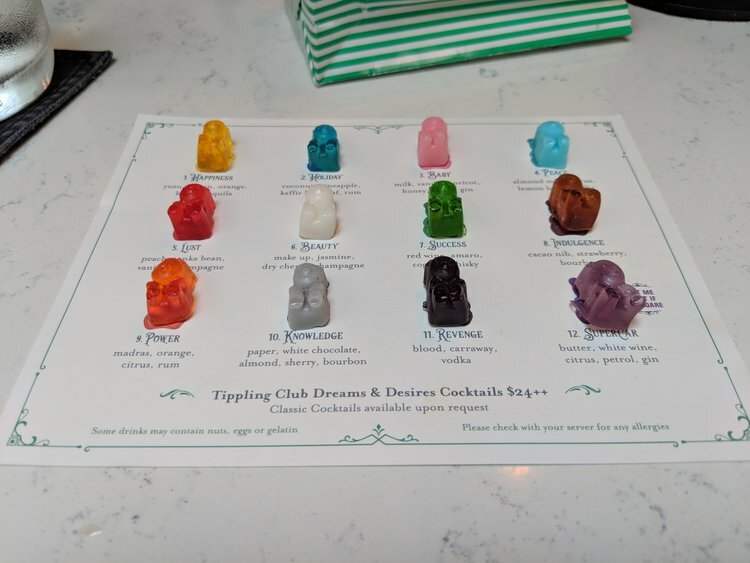 Each bear corresponds to a cocktail representing a dream or desire, including: happiness, peace, success, and revenge and the bears, created by a French perfume house, capture a snapshot of what the cocktail is to taste like. Most drinks seem to lean toward the fruity or the creamy. Our bartender John wears a chef outfit rather than bartender garb to symbolize the bar’s philosophy to act as an extension of the kitchen (“drinkable food”). John is a lighthearted host, who introduces himself jokingly as 15 (he looks not a day older) and alternates between banter and carefree curses as he rattles off stories and opinions. Because the bar was planned to be launching spot for a four-bar tour, we carefully selected three: Indulgence (caco nib, strawberry, bourbon) featuring a strawberry glazed marshmallow, SuperCar (butter, white wine, citrus, petrol, and gin) with intense flavors that start out with citrus and move onto a powerful oily truffle before mellowing out to floral and featuring a chocolate bark painted like a highway, and Holiday (coconut, pineapple, kaffir lime leaf, and rum) that is poured into a coconut with a salty light cracker garnish. 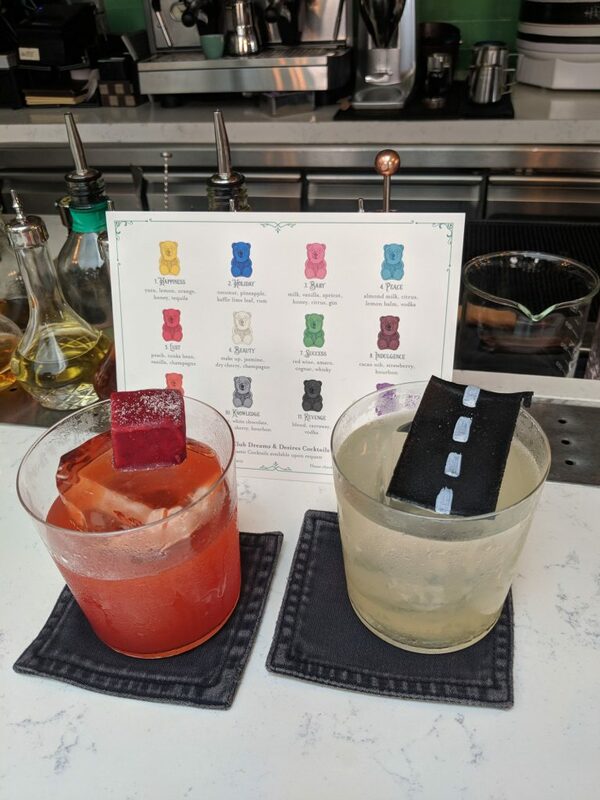 We alternate between eating the perfumed gummy bears (alone worth the trip), noshing on the garnishes, and sipping the potent cocktails. After our cocktails and under the recommendation of John, we headed toward Maison du Whisky, a scotch-focused shop that serves generous complimentary pours of whiskies before wandering back onto the main drag for the next exciting stop: Native.